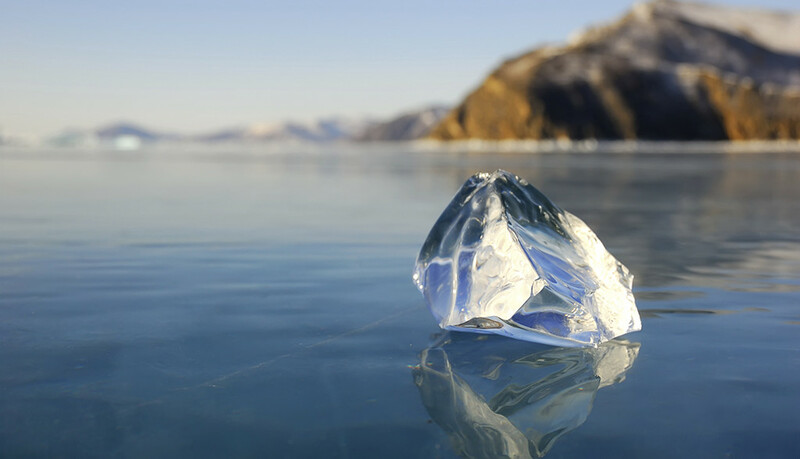 Piece of ice on the surface of frozen lake Baikal. Close-up view. FEM (finite element method) is a method for solving the differential equations that describe e.g. A mechanical problem by subdividing the solution into a number of smaller parts. In modelling this means that an arbitrary structure is divided into a number of structural elements often shaped as rectangles or triangles (two dimensions) and rectangular boxes or tetrahedrons (three dimensions). Examples of technology areas where fem-modelling is used are structural mechanics, acoustics, fluid dynamics, heat flow, optics and electromagnetic fields. Data respons has contributed with fem-modelling in several projects dealing with various applications such as elastic wave propagation in steel bolts, acoustic noise pollution in offshore piling, sound propagation in district heating pipes and a fish tag. Some of us have perhaps noticed the peculiar and captivating sound that occurs when we skip a stone over thin, newly formed ice on a lake. There are a number of videos on youtube illustrating this phenomenon and the sound the skipping makes. It is an interesting challenge to model the structural dynamic and acoustic phenomena that cause the fascinating sound. To mimic the proper conditions we need to model an ice sheet of e.g. 2 cm on top of a water volume. Above the ice is the air conducting the sound to our ears. The impact of the stone is modelled as a momentary point force acting perpendicular on the ice in the very centre of the model. In reality the listener is static and the stone hits the ice at progressively increasing distances from the listener. 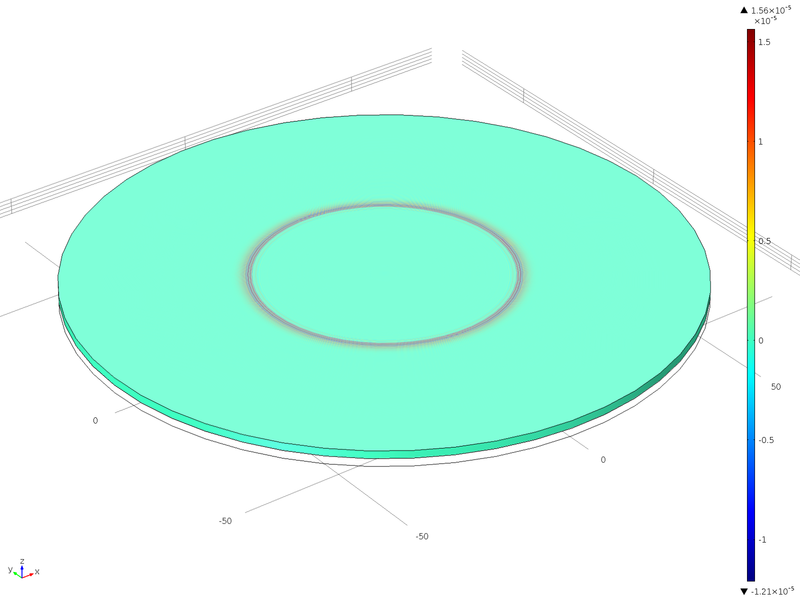 In the model we do the opposite and move the listener to different positions (radii) from the pounding stone. This way we can model the situation as a cylindrical 2d-model which greatly reduces the model complexity compared to a full 3d-model. It is interesting to notice that a bounce from the stone creates an essentially finite acoustic pulse in the air even though the ice sheet vibrates for a relatively long period of time. However the sound pulse in the air gets progressively longer as the distance from the bouncing point increases. 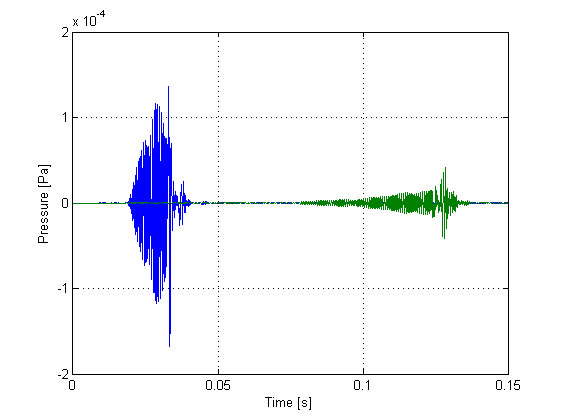 The initial part of the sound is emanating from the ice immediately surrounding the listener while the later part of the pulse is dominated by the sound that travelled through the air from the point where the stone hit the ice. Modelled acoustic pulses at a height of 1.5 m above the ice and at a distance of 10 m (blue) and 40 m (green) from the point where the stone hit the ice. To the human ear, the pulses created by the model sounds just like the real acoustic pulses. The picture shows the modelled acoustic pressure field (air cross section) in 5 m (y-axis) of air above the 2 cm ice sheet at 15 ms after the bouncing moment. It is evident from the picture that the sound reaching the human ear located somewhere along the x-axis (radius) is composed of both sound emanating directly from the ice surface beneath and a pulse travelling through the air from the point where the stone hit the ice. The sound coming from the ice below is the result of a horizontally propagating vertical vibration of the ice acting on the air above. The pitch of the pulses depends on the thickness of the ice. A 5 cm ice sheet results in a frequency peak at approximately 700 Hz and a 2 cm ice sheet results in a peak at approximately 1500 Hz. This picture shows the pulse (acoustic pressure) after 100 ms, propagating from the point of impact in the centre. The top surface of the model is a matched impedance surface allowing the sound to properly leave the model at 2 m above the surface of the ice. Below the ice is the water volume and the model is equally good at modelling what a diver in the water would hear from the skipping stone. A reduced need for practical tests and prototypes is not the only advantage with modelling. It also visualises phenomena otherwise impossible to see or measure and thereby increases the intuitive understanding of the modelled process. 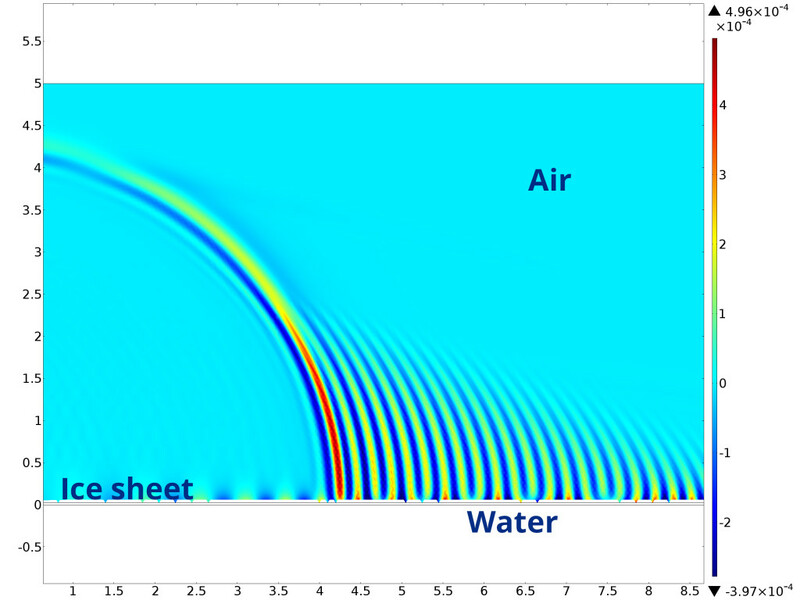 Examples are sound and mechanical stress fields that are made visual by the modelling tool. In practical tests and measurements there is always noise present, and it is sometimes difficult to independently change a single parameter in order to study its influence on the total system. In modelling, individual parameters can be altered at will and noise is not present unless it is deliberately added to the model. The performance of an ultrasonic underwater data communication link depends on several factors such as the transducer design, form of modulation and the acoustic propagation situation. The signal processing necessary for the modulation converting data bits to acoustic pulses can be modelled in matlab and the performance of the transducer together with the acoustic circumstances can be modelled using fem. Combined these two tools let us model and fine tune the entire system before moving on to prototype development and practical tests. An ultrasonic transducer is often resonant and the efficiency is strongly dependant on the frequency of the carrier chosen for the data modulation. It is thus essential to know the resonance frequency of the transducer and also the sound radiation pattern as the output power varies with the radiation direction. The piezo electric element vibrates and the vibrations spread through the entire transducer structure and perhaps further. The acoustic radiation field depend on the entire mechanical design of the transducer and modelling reveal how different parts of the transducer vibrate and affect the emitted field. 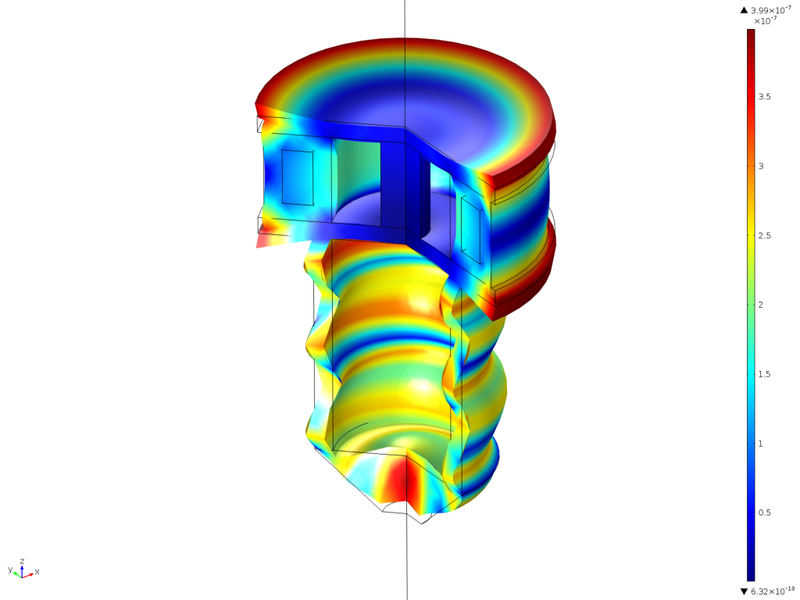 Fem enable us to test and modify the mechanical design in order to reach an optimal acoustic output. The picture shows a transducer model complete with piezoelectric ring and housing. 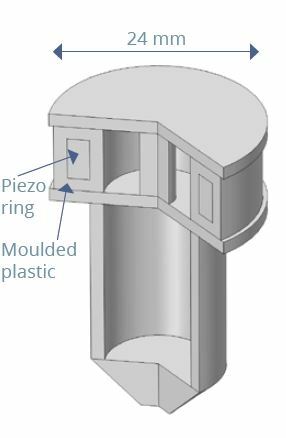 Moulded plastic covers the piezo ring and protects it from the water. It is important to get the design correct and use a suitable material to achieve good mechanical impedance match between the piezo ring and the surrounding water. This is a visualisation of the acoustic level field in the water surrounding the transducer. It is obvious that the intensity of the sound at 50 kHz varies with both the aspect angle and distance and that the maximum communication range will depend on the orientation of the transducer. The colour scale is in dB rel. 1µPa. The graph to the right shows the acoustic output level referred to a distance of 1 m in the horizontal plane of the transducer. 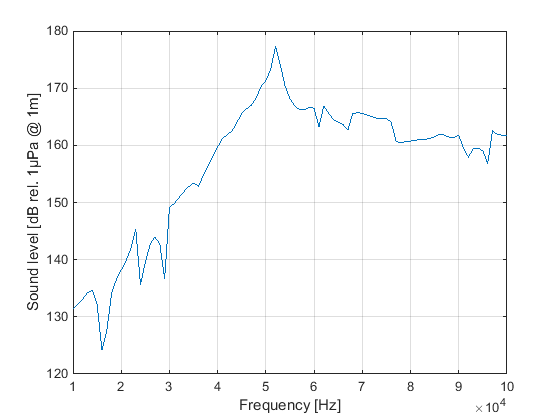 Clearly the transducer is resonant and is suitable for a carrier frequency of approximately 50 kHz. The model includes the piezoelectric effect and the transducer is excited by 35 Vrms. The picture to the left shows (greatly exaggerated) how the entire transducer vibrates when the piezo ring is excited by the electric 50 kHz signal. 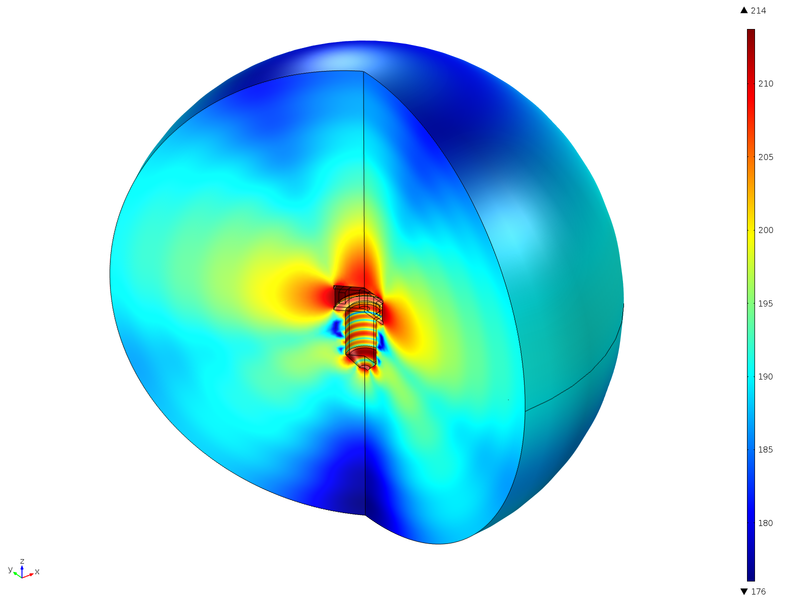 This Comsol Multiphysics model includes piezoelectricity, structural dynamics and acoustics and thus models the complete chain from electric input to acoustic output.